There are two camps of people in this world. Those who see October as the month where Halloween comes around, and those who see October as the month where Halo 5: Guardians will be released. I can't say that Halo 5 tastes better than free candy, but it's slated to be released 4 days before Halloween, so there's that. The Halo franchise is what made the Xbox a competitive system, however this is the second Halo game in a post-Bungie world. While there are throngs of people chomping at the bit to play this game, do the past deeds of Master Chief earn our trust in future installments? Microsoft hopes so, and the stock of Halo is a commodity they can't wait to open the trading floor on. Microsoft knows the importance of a Halo release, and is putting it's full might into selling this game's worth to gamers prior to release. We've got special editions, pre-order bonuses, and multiple skinned peripherals just to name a few thematic marketing tie-ins. Whether you are sure that Halo 5 will adorn your shelves on day one or you're just looking for a good return on investment, here's a handy roadmap to navigate through buying this game. Halo: The Fall of Reach - Animated Series: I didn't even know they made this, but you'd be better off just playing Halo: Reach. A metal casing for the game: At this point you can just assume a collector's edition has a metal disc case. Guardian model by Metal Earth: It's a little thingy you put together made out of metal sheets. Just buy one at PAX or something. Spartan Locke's Classified Orders: Um, it'll be posted online in a day. Dossiers on Blue Team and Fireteam Osiris: Ok, at this point Microsoft needs to put some of this in the actual game. Skip on principle. 14 day free trial of Xbox live: Who's going to buy a Halo game and doesn't have an Xbox live account? 14 Premium Requisition packs: Think lunchboxes from Fallout Shelter, and just as optional. You earn these through playing the game so don't bother spending cash on them. Only if you want the statue. 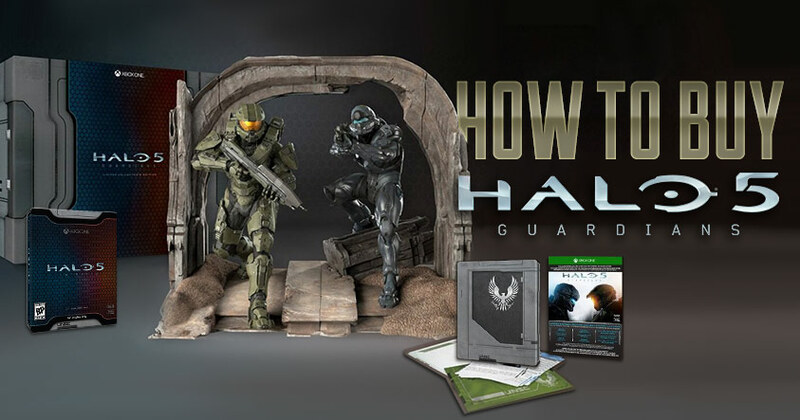 For only $99 you can get literally everything listed above minus the statue in the Halo 5: Guardians Limited Edition, so you're basically buying that plus a $150 statue. "Xbox One 1TB Limited Edition Halo 5: Guardians Bundle" is a mouthful, but damn if it isn't one of the better-looking game tie-in consoles. The lines are crisp, the hard drive is tasty, and even the controller looks sharp. Plus, you get a copy of the game! If you don't already have the Xbox One and were looking for Halo 5 to jump in, this is tempting. However, the vanilla 1 TB Xbox One isn't ugly by any means, and is $100 cheaper. You could buy the vanilla Xbox One and the Limited Edition Halo 5 and get more bang for equal bucks. FINAL DECISION If you must have extras, go for the Limited Edition. Go for the statue version if you have too much money and shelf space. And hate going out to eat. 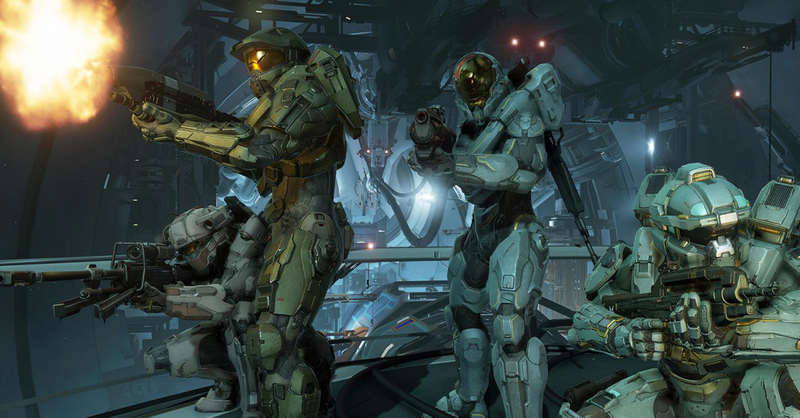 Skip the console bundle unless you need your Xbox One permanently Halo-tagged. Gamestop gets you a few trinkets. First off, a sentinel battle rifle with laser targeter and bloodthirst weapon skin. Being that your gun is all that you usually see on your HUD, a little spice might appeal to people. Preordering from Gamestop also nets a Spartan Locke armor set for multiplayer. Honestly having one of the main characters being included in the multiplayer should be cooked into the main game, but again, spice. Amazon is offering a Projection SMG with Long Barrel, so hurray for that. Would rather a price cut. Best Buy is offering a $10 in the useless currency of Best Buy rewards, but also a Longshot Assault Rifle with Recoil Compensator AND Athlon Iccus Armor. I'm not saying I care about different guns and armor, but Best Buy blows Amazon's one gun out of the water with that offering. But what's this? Microsoft Store swoops in with a Recon Assault Rifle with Energy Bayonet (which sounds cool), a Lagrange Assault Rifle Weapon Skin AAAANNNDDD a $10 Xbox gift card, which is far more useful than Best Buy currency. Nice one Microsoft! Walmart offers a $4,99 VUDU credit, because Walmart is dumb. Target gets you a $5 Target gift card, which honestly is a nice deal if you were already planning on getting the game. If you already know you're going to buy this game, you might as well get some extra stuff for your loyalty. While preordering is an evil of the modern gaming world, why not bend that evil to your whim for an alt skin? FINAL DECISION: - YES to preordering... from the Microsoft store. Even if you don't care about the weapon (but you should because energy bayonet), a $10 Xbox gift card could buy an indie game or work towards an Xbox live renewal. Currently none have been announced, however Microsoft has announced that the multiplayer will periodically release new maps for free. There's never been a single player DLC for a Halo game, and that announcement kinda takes any wind out of a multiplayer one. FINAL DECISION: No to Season Pass, if there even is one. Free multiplayer updates is what's going to keep that game relevant and widely adopted.